What is H.E.M. Ankle Rehab? H.E.M. is a powerful, comprehensive, and easy to do 3 step system that heals a sprained ankle in significantly less time (3 – 7 days) than the typical ankle treatments (rest and ice: average healing time is months or years with a chronically weak, painful and stiff ankle). Plus, H.E.M. significantly increases strength, stability and healthy range of motion in your ankles for better sports performance and a lower risk of re-injury without the need for ankle braces, tape or wraps. Does H.E.M. work for OLD injuries? YES! Maybe you have an old sprained ankle that never healed properly and has continued to cause you chronic pain… Well, you are not alone. Research estimates that up to 30% of people who use rest and ice still have pain 1 year later! Fortunately, H.E.M. can help you heal fully. It doesn’t matter how old the injury was or how weak your ankles are now, the H.E.M. System will help heal rebuild your ankle step by step. We begin by eliminating any residual swelling or bruising as well as breaking up old scar tissue. Then, we get healthy blood into the injured area and start repairing muscle and ligaments. Finally, we will increase natural strength, stability and healthy range of motion in the ankle for a full recovery, even if your injury was years ago. And remember, we have a 30 day no hassle money back guarantee, so you can try H.E.M. risk free and always get a refund if you are not fully satisfied with your results. Is H.E.M. easy to do? YES. H.E.M. Ankle Rehab is a simple 3 step system that is not complicated or difficult to follow. The program will show you what to do, step by step, from the moment you get a sprained ankle all the way until you are fully healed. We have created very easy to follow, step by step videos and a high quality eBook to ensure you can quickly use H.E.M. from home, within minutes of completing your purchase. How long does H.E.M. take to do? All 3 steps of H.E.M. take about 30 minutes. You can do each step from home without ANY equipment and each step is completely explained through the videos and eBook, so you can do everything simply and quickly. How many times a day do I have to do H.E.M.? You can do H.E.M. 1-2 times a day for best results. It is not necessary to do H.E.M. more than once a day, but if possible, twice a day is great. How do I know H.E.M. if will work for me? H.E.M. works for ALL types (high, lateral, medial, etc…) and grades (Types 1 – 3) of sprained ankles as well as weak ankles and old injuries. H.E.M. also works extremely well for achilles and a wide variety of other calf and foot injuries too. Plus, we have a very simple, no hassle 30 day money back guarantee if you are unsatisfied for any reason. How long until I am out of pain? For most ankle sprains, H.E.M. will get you out of pain and walking normally in about 3 – 7 days, but some people notice substantial improvements after 1 – 2 days. Before you get back to more rigorous athletics and fitness, we recommend waiting about 7 – 10 days to make sure your ankle has healed properly. For serious injuries (like a rupture of the tendons or complete tear), it may take a few weeks to completely heal, but it will still be significantly faster than using rest and ice as your healing strategy (which would take 3-6 months or longer and will leave you with a chronically weak, stiff and painful ankle at a high risk of re-injury). While H.E.M. works fast, we always recommend taking the healing process slowly. In fact, many people see such fast results, that they start doing too much, too quickly. Take your time and proceed gently, because our belief is that if you allow your ankle to fully heal, it will benefit your immensely for the rest of your life. I have weak ankles... Can H.E.M. help me? Absolutely! Even though you may not need to do the Rehab program in H.E.M., you are a perfect candidate for the Prehab Program in H.E.M. This section is meant to be used on weakened ankles as well as recovering ankles that need more protection. So, if you have a sprained ankle, you will want to wait until you are out of pain to begin the Prehab section. But, if you simply have weakened ankles, you can being the Prehab section right away and you will start seeing results very quickly, usually within a matter of days. You can expect increased speed, agility and balance as the ankles become significantly stronger, more stable and exhibit healthy range of motion without the need for ankle braces, wraps or tape. What is the difference between the step by step videos and ebook? Some people prefer to read a book while others prefer to watch videos. Therefore, we created a series of short, step by step videos to supplement the eBook to make H.E.M. super easy to understand and implement immediately. You have the videos and eBook at your disposal, so you can refer to either or both whenever necessary. When can I watch the online videos and download the ebook? Immediately after your purchase, you will also receive an email with a username and password that will enable you to login instantly and start watching the step by step videos and download the eBook. Will I be able to watch the videos and read the ebook on my computer, tablet or smart phone? YES. The H.E.M. Step by Step Videos are compatible with ALL browsers, tablets and smart phones. The videos load immediately and are very high quality. AND YES. The H.E.M. 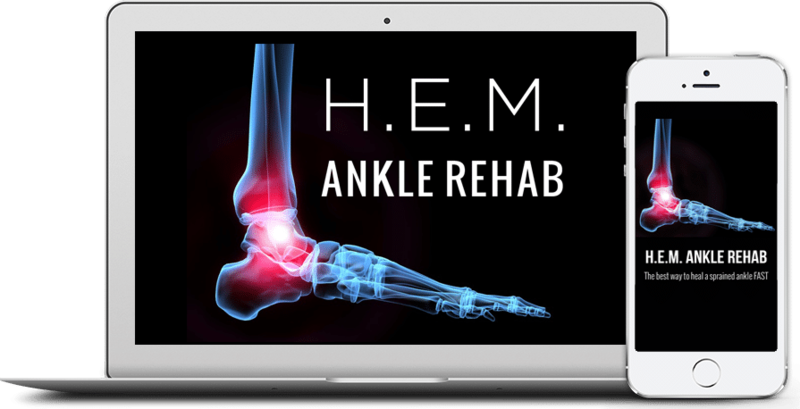 Ankle Rehab System eBook is in the form of a high quality PDF, which means you can read it on any computer, tablet or smart phone. You can use a huge variety of FREE apps to read a PDF. Almost all computers, tablets and smart phones have PDF reading apps built in. However, you can always download the FREE Adobe software or other FREE PDF reading apps very quickly, if necessary. How long do I have access to the videos and ebook? FOREVER. The step by step videos and eBook never expire. Can I get H.E.M. as a hard cover book instead of an ebook? Sorry, but H.E.M. is only available as online step by step videos and a high quality ebook. Part of the reason we did this is so that you do not have to pay for shipping and wait a week for your copy of the book to arrive, because when healing your injury, time is of the essence. So, the H.E.M. eBook is only available in a digital form that you can download immediately after you complete your purchase. You will download a PDF version of the eBook which is viewable on any computer, including an iPad, iPhone or any other mobile device. And of course, you also get immediate access to the online step by step videos too! Who is Scott Malin, NASM-CPT, the creator of H.E.M.? Do I have to buy any other equipment? NO. You do NOT have to go out and buy ankle braces, wraps or tape. All that stuff that is just going to make your ankle weaker and more susceptible to injury by creating a new crutch for the ankle. Instead of that, you will be actively increasing the strength, stability and healthy range of motion in your ankle for a full recovery that does not require ankle braces. And that means you can expect a higher level of sports performance and mobility while decreasing your risk of future injury. Does H.E.M. work for a high ankle sprain? Yes! If you have a high ankle sprain, the syndesmosis ligaments will be damaged. Fortunately, the H.E.M. System gets the same fantastic results for people with a high ankle sprain as with the more common sprained ankle injuries. What if I have an ankle fracture? The first thing you should do after a sprained ankle is get an x-ray to make sure you do not have a fracture. If you do have a fracture, then you must wait for the break to heal first and then have your doctor clear you for rehab. Then, once your doctor lets you know you are ready, H.E.M. will be extremely beneficial and integral in helping your ankle fully heal. H.E.M. will help you regain lost strength, stability and healthy range of motion while also helping you eliminate any residual swelling and/or pain. What if I try H.E.M. and want a refund? WE GUARANTEE A NO HASSLE REFUND. The H.E.M. Ankle Rehab System has helped over 50,000 people heal a sprained ankle FAST and we are confident you will enjoy the same great results! Just try the H.E.M. System for up to 30 days and if you are unsatisfied for any reason whatsoever, we will give you a 100% refund of your money, no questions asked. We process refunds within 2 -3 business days and without any hassle at all. Just send us an email and that’s it!